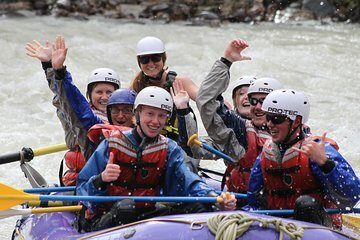 Prepárate para los únicos rápidos de clase 3 de Jasper en el río Sunwapta. Prepárate: te vas a mojar. Use su traje de baño debajo de su traje de neopreno y traiga una toalla y su sentido de la aventura. Si tiene sus propias ruedas, puede ahorrar un poco al reunirse con los guías en el río en lugar de pagar por el servicio de traslado desde el sitio de Jasper. Cada balsa tiene capacidad para seis personas, usted es una parte importante de la tripulación. We did the the Sunwapta River rafting trip, class 3 rapids. It was exhilarating, our guide was Karleigh, she was experienced and directed us to row when we needed to, we felt very safe. We got wet and it was not a constant row, which was nice, as we took in the beautiful scenery along the way. The water is very cold and the rapids are challenging but not something that is difficult when you have 6 people rowing. We never did this before, and no experience is required. This tour is a very good introductory to white water rafting !!! Loved it and would definitely do it again !!! Miss the mountains already !!! Had an awesome trip. Highly organised, good focus on safety whilst ensuring it remained exciting. We had a great time. Jeffery led our boat, he was clearly very experienced and knowledgeable but ensured it remained fun and chasing the best waves. Would highly recommend.